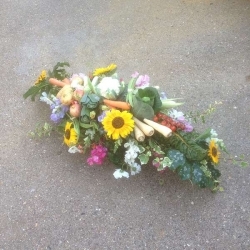 A beautiful bespoke spray containing fresh seasonal flowers and vegetables, ideal for those who loved their allotment. We can alter the contents to suit your individual wishes. Picture shows 3 and a half foot size.